Those of us who care about broadcasting are dismayed at the smashed, squashed, and distorted audio that is often heard on both radio and television - and especially on radio. But the answer is to learn how to do it right so that you can take the lead. Show them how it's done! This course takes a practical, real-world approach. An entire chapter is devoted to human hearing and how it actually responds in the real world. All of the familiar terms are here: attack and release times, compression, peak limiting; but emphasis is given to how these sound to the listener. The audio processing that is available now is an order of magnitude better than the standards of just 10 years ago. It continues to improve, too. Many of the assumptions and techniques that were common with older processors are no longer valid. A state-of-the-art digital multi-band processor can execute billions of floating point mathematical operations per second, meaning that very complex algorithms (for example, exhaustive Fourier analysis) can be applied to the audio in real time. These units can be driven (and can drive) much harder before audible distortion sets in and offer a phenomenal range of control over the final sound. You can literally adjust these for anything from no processing to obnoxious on-air loudness. This course is for the intermediate-to-experienced broadcast engineer who is already familiar with the basics of good broadcast engineering. It will be assumed that you know how to mount equipment with proper grounding and shielding, and then connect the inputs and outputs as needed; whether AES, S/PDIF, analog, composite, or otherwise. You are proud of your studios and transmitter site(s), and keep everything on air and operating properly, but would like to know more about that "dark art" known as audio processing. 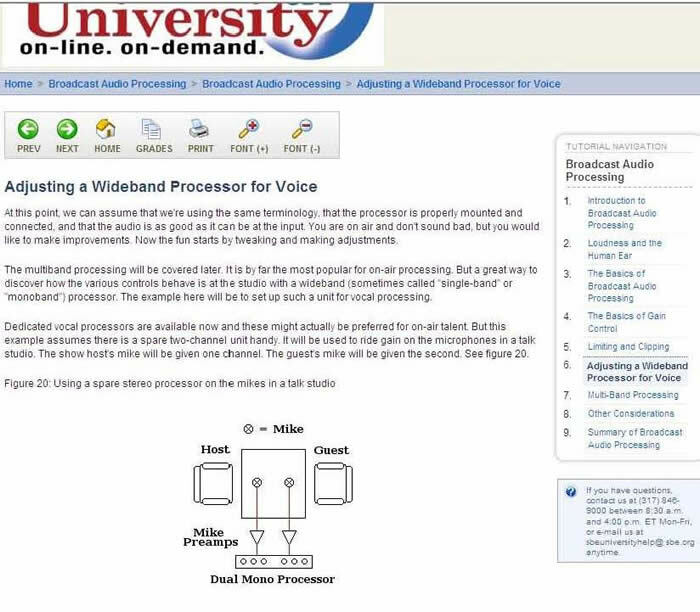 This course is especially targeted to radio engineers, for whom sound is the primary marketable product. The principles discussed here can be applied across the board, but given that most of the innovations in audio processing have come from the radio community, that will be our focus. Stephen M. Poole, CBRE, AMD, CBNT, is market chief engineer for Crawford Broadcasting's Birmingham cluster of radio stations. A musician and broadcast veteran with three and a half decades of experience, he has also done professional sound and lighting, as well as contract programming and custom electronic design. He and his wife Sandy live near Warrior, AL.